"Don’t be fooled; the original disk-based release might be considerably harder to find, but it tears this CD “upgrade” into thousands of itty-bitty pieces." KIDS!! LISTEN!! 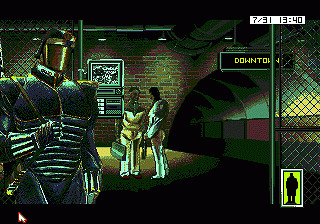 Rise of the Dragon might be a classic graphic adventure, but while the Sega CD port is a hell of a lot easier to find, it doesn’t even compare to the awesome PC original. It doesn’t take a genius to realize that something has gone very wrong here, as everything seems to have been bathed in kryptonite. 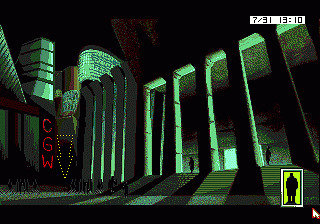 Presumably this is why all the screenshots on the back of the case were actually taken from the VGA version (oops, our bad), since “a visually stunning futuristic environment of nearly 100 really dark, grainy locales rendered in five shades of green!” would have looked a bit silly on its hyperbolic list of features. According to the internet “some people” actually prefer the graphics this way because they’re supposedly more atmospheric. I don’t know who these people are, but they must be high. 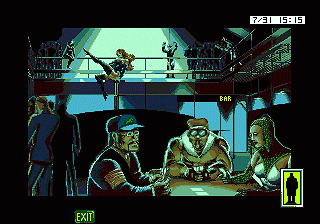 Not only has the background animation been cut severely, but these visuals are downright embarrassing when the much earlier Amiga port looks surprisingly good despite having being reduced to 32 colors. As far as the “CD quality audio track with unforgettable music and haunting sound effects!” goes, the music is a bit of an improvement over the old AdLib score – that said, it doesn’t even come close to the PC’s high-end MT-32 soundtrack. But since this is the only version of the game released on CD-ROM, it does exclusively feature voice-acting for all the characters. Unfortunately they’re pretty rotten, even with Cam Clarke (known for such roles as Liquid Snake, Sky from Jade Empire, and Leonardo the Ninja Turtle) in the lead role, since he does it with a cheesy tough guy accent. Crappy voice acting was practically a given for console games from this time period, but since this is also when companies like Sierra and LucasArts were starting to assemble all-star voice casts for their computer games, it’s well worth noting to expect the former. The addition of the voices also compelled the development team to remove all of the text bubbles originally used for the dialogue and descriptions; besides forcing you to listen to this dreck it also means that merely looking at something requires you to wait a few seconds for the audio to load. And even though it got slapped with an MA-17 rating, presumably because of the risqué material since it’s nowhere near as violent as the MA-13 Snatcher, they also excised the scene where Blade and his girlfriend make whoopee after their night on the town. Maggot-infested corpses are all very well and good, but a man with his shirt off touching a woman’s bare leg is INSANITY! Don’t be fooled; the original disk-based release might be considerably harder to find, but it tears this CD “upgrade” into thousands of itty-bitty pieces. If you enjoyed this Rise of the Dragon review, you're encouraged to discuss it with the author and with other members of the site's community. If you don't already have an HonestGamers account, you can sign up for one in a snap. Thank you for reading! None of the material contained within this site may be reproduced in any conceivable fashion without permission from the author(s) of said material. This site is not sponsored or endorsed by Nintendo, Sega, Sony, Microsoft, or any other such party. Rise of the Dragon is a registered trademark of its copyright holder. This site makes no claim to Rise of the Dragon, its characters, screenshots, artwork, music, or any intellectual property contained within. Opinions expressed on this site do not necessarily represent the opinion of site staff or sponsors. Staff and freelance reviews are typically written based on time spent with a retail review copy or review key for the game that is provided by its publisher.